Growing up in the Netherlands, why did you choose to study in the U.S.? I really liked the idea of being able to do my own research, and I was interested in pursuing graduate studies in the United States. In Europe, PhD students are usually assigned specific research projects. You have to be very passionate about the subject in order to study it in depth for 3-5 years, and in the U.S. students are allowed to choose their own research path. My first visit to the U.S. was when I went to see NYU in 2005. It was immediately after a snowstorm, which was a novelty for me. I’ll never forget my first ride in a yellow cab in the snow, and seeing The Gates by Christo and Jeanne-Claude displayed in Central Park. It was an amazing first experience of the city. What has been your trajectory since you received your PhD at NYU? Immediately after I graduated from NYU in 2010, I joined Weill Cornell Medicine’s Sackler Institute for Developmental Psychobiology as a Postdoctoral Fellow. I was there for two years and that was how I got involved in the arts, through an annual Art & Science meeting that faculty at the Institute were involved in. 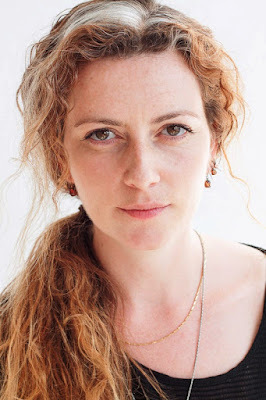 How did you become a curator-liaison at the Annual Watermill Art and Science: Insights into Consciousness Workshop? Just after I graduated from NYU, in the summer of 2010, I got involved with The Watermill Center, which was founded in 1992 by theater and visual artist Robert Wilson. They support projects that integrate different art forms and host the Annual Watermill Art and Science: Insights into Consciousness Workshop. I later started acting as a curator-liaison for the annual workshop and I am also part of the Steering Committee. Every year we bring together a group of artists and scientists to collaborate in a workshop setting. We have a mix of more famous artists, and people who are passionate and talented, but may not be as well-known yet. It is a three-day workshop, and has brought together some brilliant people over the years. Next year will be our eighth year. Can you speak about your experiences working with performance artist Marina Abramovic? I became involved with The Watermill Center right after Marina Abramovic’s retrospective at the MoMA The Artist is Present, and the Watermill team was examining the effects of Abramovic’s performance on the audience and on the artist. Her piece was about maintaining the mutual gaze, which is when two people maintain eye contact. Abramovic was very interested in working with The Watermill Center to turn this exercise into a scientific experiment. Initially, she was hoping to learn what is going on in her brain as she is performing, but the experience of a single person is not very informative from a scientific perspective. Together we turned this idea into Measuring the Magic of Mutual Gaze, a wider science experiment-art installation about the relationship between eye contact and connectedness. We explored whether eye contact may help synchronize brain activity between people. We wanted to pose the question: What does it mean to connect with another person? At the time, there were very few groups conducting these types of ‘hyperscanning’ experiments. 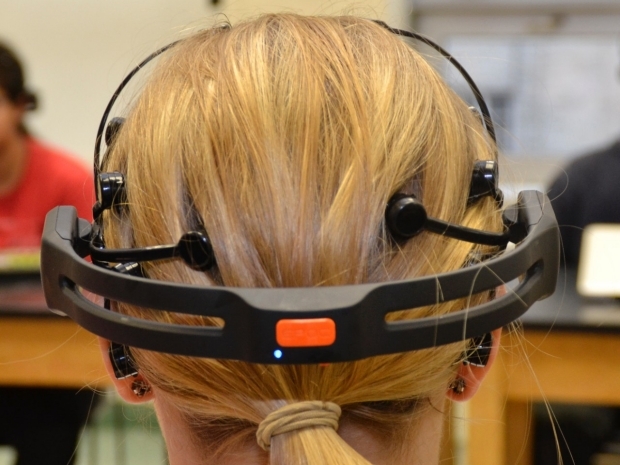 Our team used portable EEG headsets to record participants’ brain waves. That allowed us to bring our equipment into museums and collect data from multiple subjects at the same time. We examined how in sync people’s brains were while they were communicating, and we were able to evaluate the results in real time. 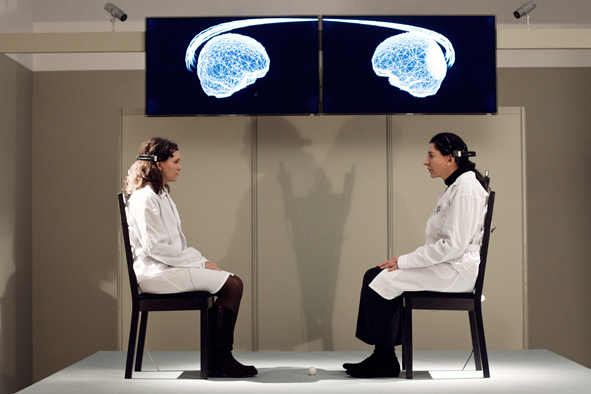 The experiment with Abramovic was unique in that it brought a neuroscience experiment into a museum. The subjects were on a platform and their brain activity was monitored as museum visitors looked at them. We also incorporated a real-time visualization of what was happening in each of our research subjects’ brains as well as moments of brain synchrony, which was projected onto screens behind the participants that were only visible to the audience. Where did the experiments go from there? There were multiple directions we went in after that. Another experiment, Mutual Wave Machine, is still touring and pushes the neuro-feedback component. We have the technology to translate brain synchrony into audio-visual elements, which means that audience members can see and hear a representation of participants’ brain activity in real-time. 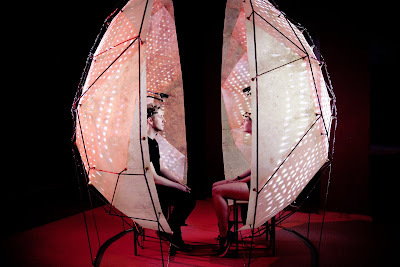 In the experiment, people are sitting inside a capsule made up of two egg-like half shells, and interact with each other for 7-10 minutes. The participants see more light projected on the shell when there is more synchrony between them. The work alludes to questions of what it means to synchronize or connect with another person. It allows us to examine social functions ranging from the subjects making larger movements in tandem, to subtly picking up and responding to minor social cues. In interacting with each other, we are accustomed to using social cues with respect to how people are listening, or not listening, to us. Where has Mutual Wave Machine been presented? We have presented it in fifteen sites around the world, in both art and science contexts, such as the MUSEUMN8 NEMO Science Center in Amsterdam and the AS ONE exhibition at the Benaki Museum in Athens. We have also conducted the experiment at science-oriented events and innovation fairs. At this time, we have collected data from several thousand participants. What research are you doing now in the Poeppel Lab? We collaborated with two local high schools and conducted a “brain-to-brain synchrony in the classroom” study, which involved collecting EEG data from high school students during their normal classes in their school. We also helped the students conduct their own neuroscience research experiments. We are also developing a neuroscience curriculum for high schools through funding from the NIH. One of the main motivations in developing the curriculum is working with under-served and under-represented populations in STEM fields. It has been very inspiring to work with the public in our experiments. It is easy as a scientist to drift away from the question you started with, but if you are continually interacting with your subjects, it can help pull you back to the central issues. A lot of what we do is ask question after question, and it is valuable for our research subjects to witness that process.